CAIRO -- Archaeologists clashed at a conference in Egypt on Sunday over a theory that secret burial chambers could be hidden behind the walls of King Tutankhamun's tomb. Speaking at the conference, former antiquities minister and famed Egyptologist Zahi Hawass rejected the theory that undiscovered chambers lie behind the tomb and likely contain the tomb of Queen Nefertiti, one of pharaonic Egypt's most famous figures. The theory has prompted new exploration and it has been extensively scanned by radar. "In all my career ... I have never come across any discovery in Egypt due to radar scans," Hawass said, suggesting the technology would be better used to examine existing tombs that are known to contain sealed-off chambers. British Egyptologist Nicolas Reeves meanwhile defended the theory he put forward last year. Preliminary results of successive scans suggest the tomb contains two open spaces, with signs of metal and organic matter lying behind its western and northern walls. "I was looking for the evidence that would tell me that my initial reading was wrong," he said. "But I didn't find any evidence to suggest that. I just found more and more indicators that there is something extra going on in Tutankhamun's tomb." These chambers, he believes, hold the burial of Queen Nefertiti, the wife of Akhenaten, a pharaoh who was Tutankhamun's father. 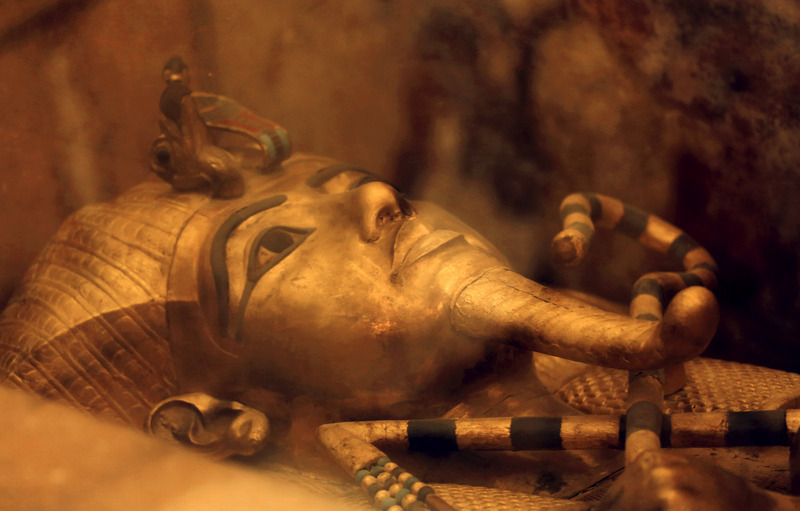 Another possible clue to what could lie within; the art and design in Tut's tomb suggests it wasn't built for a king. "That is a tomb type favored by queens," Reeves told CBS News' Alex Ortiz in September. Over the years many people have claimed to have found the queen's tomb. "If I'm wrong, I'm wrong, we move on," Reeves told CBS News in September. "But it's something that we can't just ignore, because if I happen to be right... it will change everything." The conference aims to bring broader scientific rigor to what so far have only been tantalizing clues in recent explorations of the tomb. Antiquities Minister Khaled el-Anani, who attended the conference, said that scans of the tomb would continue in line with the group's recommendations, but that no physical exploration would be allowed unless he was "100 percent sure there is a cavity behind the wall."